Great Shield Universal Bicycle Handlebar Mount is designed to install effortlessly and fast on any bike’s bar and is a pretty impressive gadget that works perfectly with any handheld device. It comes with a fully adjustable mount and a Clip Grip with some great touches that offers a general good value. 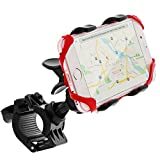 Great Shield Clip Grip Bicycle Mount is totally adjustable and the holster is fully rotatable and turns a full 360 degrees which enables you to view your device either in portrait or landscape mode. The Great Shield Clip Grip Bicycle Mount is constructed with a soft rubber grip that will securely hold your device without scuffs or damages. With or without the skin or case, the clip grip secures your device firmly. The Great Shield Universal Bicycle Mount is easy to stow when not in use due to its portable size. It is also lightweight, sturdy and can withstand high temperatures. The Great Shield Universal Bicycle Mount can be used on many smartphones, tablets and even GPS Navigational devices. The Great Shield Universal Bicycle Mount that works across most hand held devices most especially smartphones. For the price, it is really a good accessory to consider for your bike. It is an awesome device and is preferable to holders that are just specific to a particular phone model. The clip is solidly built with a heavy duty spring to hold the device in place. It attaches easily to bicycle’s handlebars and provides enough grip to the device whether you are riding on the highway, or off-road or through a very rough terrain. The rubbery grips functions perfectly like it’s supposed to. The clamp is sturdy enough to support a bigger than average mobile phone The jaws opens sufficiently wide enough to hold any device securely which is a very nice concept. One tiny complaint though is that due to the weight of the device may cause the it to tilt and change angle more often when riding through some bumps and you have to reach out and readjust it; however it’s not really a big deal. The Great Shield Universal Bicycle Mount is a very versatile addition to your bike and works well and is a really great investment that you won’t regret.